Oh boy a lot of sewing machines have been working overtime lately getting all those doll clothes made in time for Christmas gift giving. I know how busy things get at this time of the year so I’m thrilled that you have taken some extra time to take photos and send them in. Marilynn has been seeing double lately making two of everything for her friend’s great-granddaughters and she’s even used some of the great-grandmothers clothes to make them so they will have extra special meaning to her precious great-granddaughters. And I love the tip about the button! 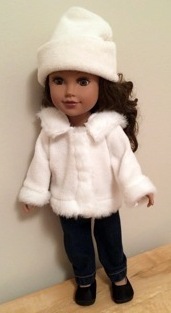 This is the funky fur coat with the beanie made from the great-grandmother’s sweatshirt. The jeans were made from an old pair of jeans using the tights pattern. 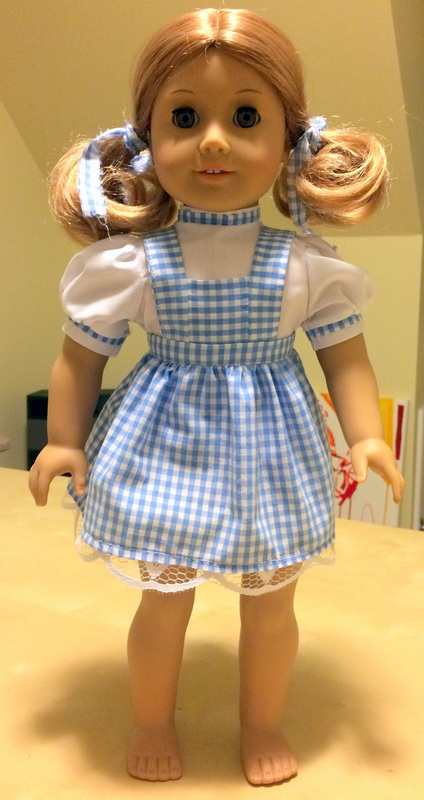 This doll is slimmer than a regular AG doll so it worked out well. This t-shirt was made from the great-grandmothers t-shirt and the tights are made from a pair of shiny purple tights that I picked up at a used clothing store. I had to take the seams in about 1/2 ” to make them skinny tights. 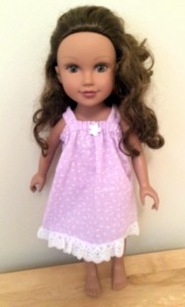 When I make the pants, I always sew a tiny button on the front of the pants so it’s easy for the girls to know which is the front.The dolls each have a summer and a winter nightgown. We all saw last month how Mary-Jane has gotten back into sewing recently and is regaining her confidence sewing doll clothes for her granddaughters. Well, I’m thrilled to say that she is now working with stretch fabric and making some cute bathers, sarongs and circle skirts. This is great to see Mary-Jane. ‘Thank you! 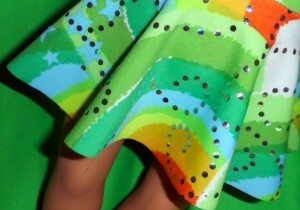 Here is a photo…getting better every time I sew. It is really is the finishing touches that make all the difference! 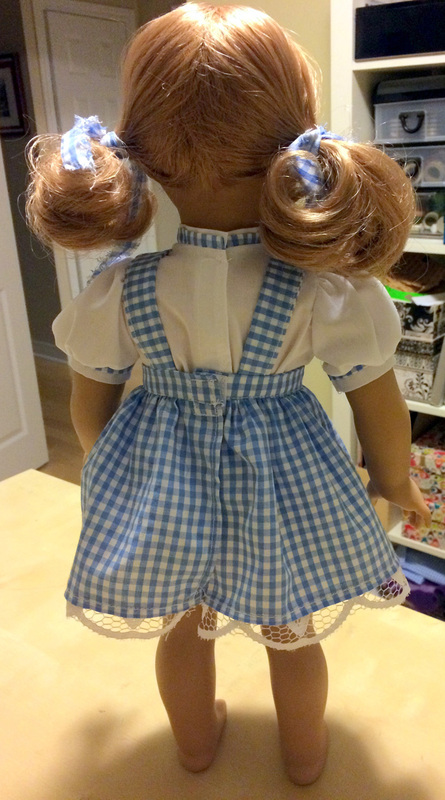 Jen has been busy making a Dorothy costume for Halloween and although she didn’t check that her pattern was printed to the correct size, it’s turned out really well. Your patterns and videos are so helpful. My step-daughter wanted a “Dorothy” costume and I found the perfect pattern on your site. Your videos are super clear and everything turned out fantastic! If the apron looks a little short it’s because I didn’t ensure my pattern printed to the right size but I went for it anyways! I am a beginner but your pattern and instructions make me look like a pro! I have bookmarked your site and will be back for more. 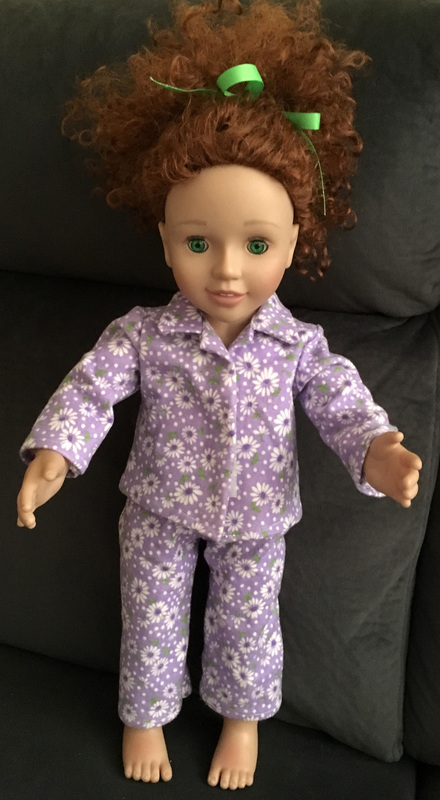 Matilda, our red headed Australian Girl doll looks great in purple and Lyn has done a great job making some really cute purple winter pyjamas. 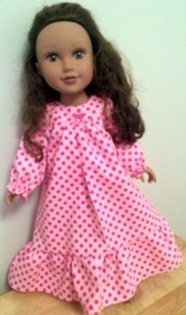 ‘Hi Rosie, I absolutely adored making up the doll winter jammies and the pattern and instructions were fabulous. The pants were no problem but the jacket stretched my skills to the limit!! I kept my cool and the videos kept me on track. I will definitely be back for more patterns soon. Looks like winter pyjamas have been a popular pattern to make up lately – must be getting cold somewhere in the world as it’s really warming up here in Australia! 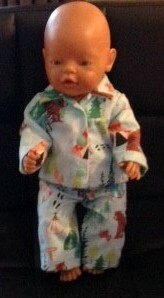 Patricia has made these winter pyjamas for a Baby Born boy doll following the adjustments that I have listed on my blog, ‘My Doll Clothes Patterns fit the 17” (43cm) Baby Born Doll’. It’s great to see some boy dolls making an appearance in my Share and Tell bog so thanks for sending this one in Patricia. I have a few more photos that have been sent in but I’ve been asked not to share them until after Christmas so be sure to keep an eye out for my January Share and Tell blog. In the meantime, don’t forget that I’m offering 20% off everything in store until Christmas so if you’ve been wanting to get a pattern or try my How to Sew Doll Clothes video course, now’s the perfect time! Just remember to use coupon code Christmas20 during checkout.